InkTober has begun. Here’s today’s sketch inspired by a beautiful front porch design by Ginny of @maplecreekmarket. Here’s a recent sketch of montauk daisies. Categories: Inspiration, Pen & Ink, Sketch | Tags: autumn, fall, Front porch, ink, inktober, Montauk daisies, pen, Sketch | Permalink. As you put your pen to the page to make that first mark, you never really know how things will turn out. At least I don’t know. Sure I have a vision in my head, but that doesn’t mean it will turn out that way. 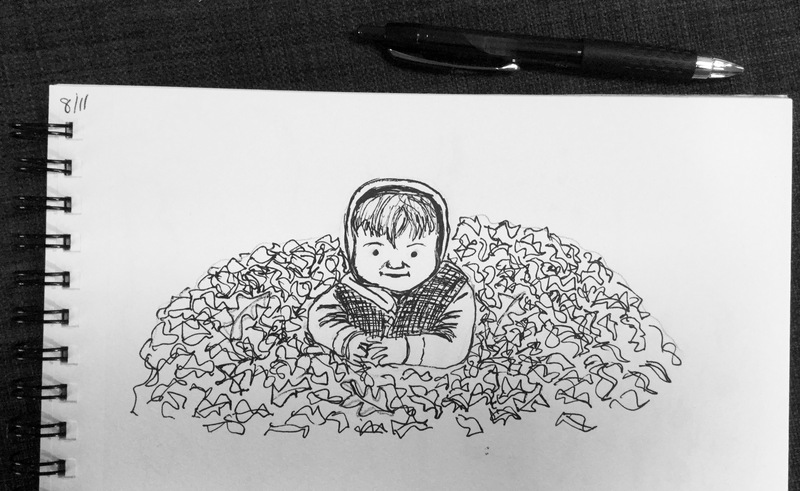 I was really pressed for time with this “little guy in the leaves.” The inspiration photo was one of my youngest son probably 8 or 9 years ago. I used pencil first to plan things a little – because you can’t erase ink. I was pleasantly surprised with the results in such a short time. This drawing experience was the opposite of yesterday’s! I was drawing in the car during my older son’s practice. I first focused in on a nearby car. Within a minute or two of drawing the car, it drove off! Without the car there I had a hard time finishing that part. I drew the car in front of me, but my pen started running out, probably because I was drawing upright on the steering wheel. I ended up focusing on drawing the chain link fence. Like I said, you never know what the result will be when you start drawing! I met the creator of Inktober at Comic Con! 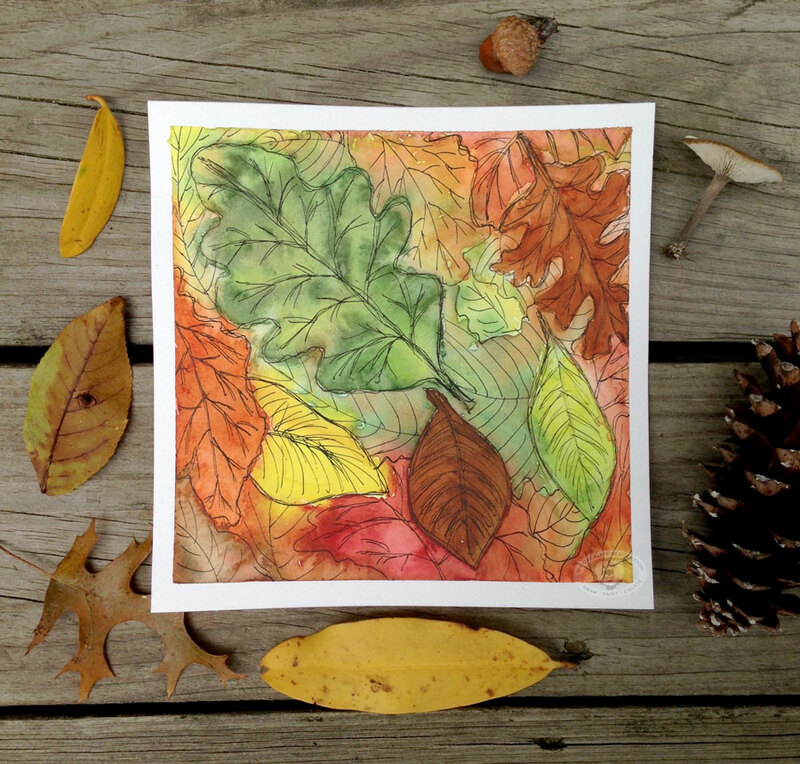 Categories: Illustration, Inspiration, Pen & Ink | Tags: Drawing, fall drawing, Fall leaves, illustration, ink, inktober, inktober2016, leaves, sketchbook | Permalink. I’m participating in InkTober this year. Jake Parker created InkTober in 2009 “as a challenge to improve his inking skills and develop positive drawing habits. It has since grown into a worldwide endeavor with thousands of artists taking on the challenge every year.” Learn more and see the official InkTober prompts here. It starts Saturday, October 1st! 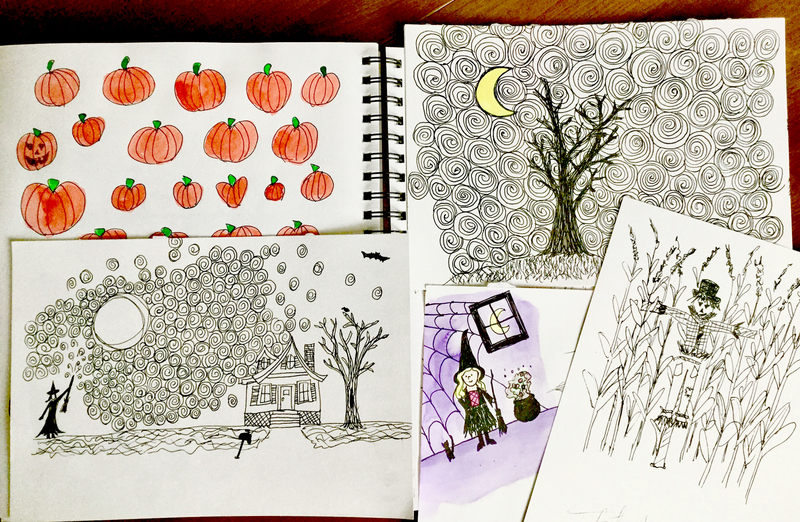 Categories: Inspiration, Pen & Ink, Sketch | Tags: halloweeen illustrations, ink, inktober, inktober2016, pen and ink, pumpkins, scarecrow, Sketch, sketchbook, zentangle | Permalink. 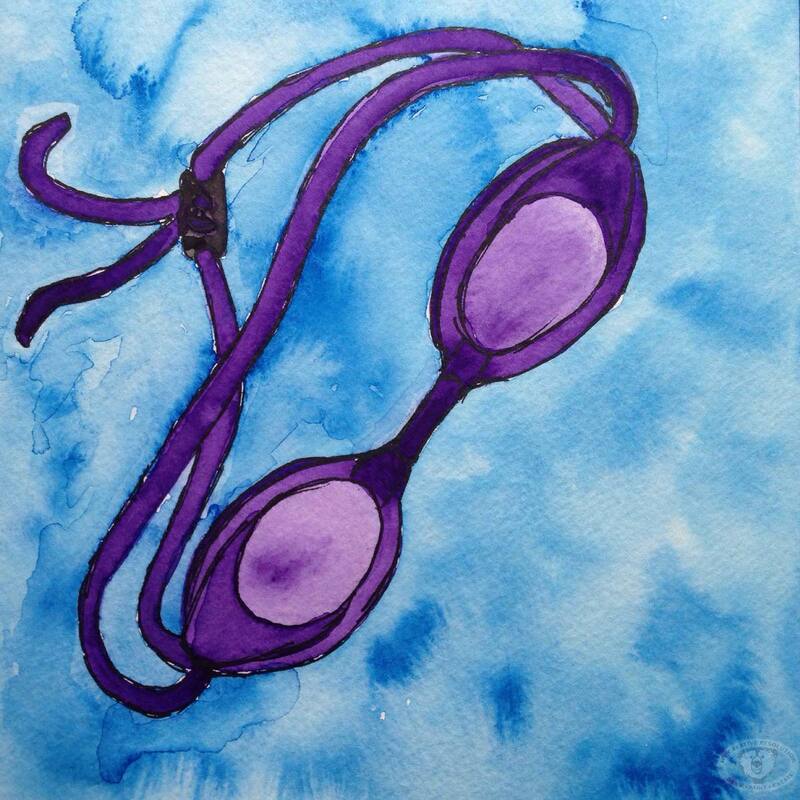 Categories: Watercolor | Tags: goggles, illustration, ink, outdoor pool, painting, pool, summer, swim team, swimming, watercolor | Permalink. I just wanted to be creative. I didn’t even know what I’d be working on. 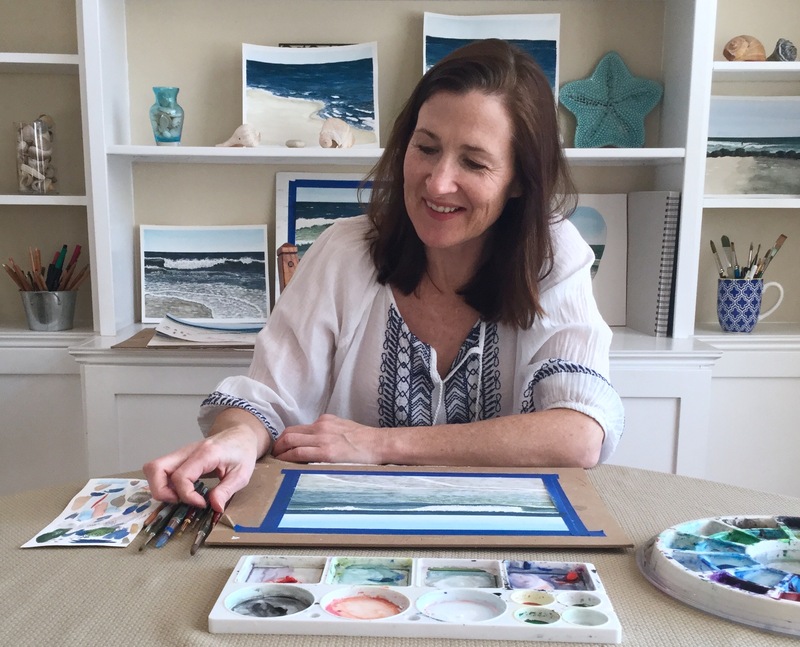 My interests were a varied list of painting, working with recycled materials, refinishing furniture, decorating my mantle, etc. The real goal was to be creative on a regular basis, and finish projects. I had a terrible habit of never finishing things. I made great progress in 2014, my interests became more focused on drawing and painting, and I finished almost everything I started, including some old projects. I knew I had come so far, and I wanted to keep growing, and learning. I wasn’t giving up. I had a long lists of goals, although this list, wasn’t as varied as the year before. Most of these items, I tried at least once. Some, like designing patterns (surface design), I adopted as a monthly goal. See all my 2015 patterns here. I want to continue painting, working on my illustration style, and designing surface patterns. And I want to learn and grow in the area of animation. See my recent post on exploring animation here. 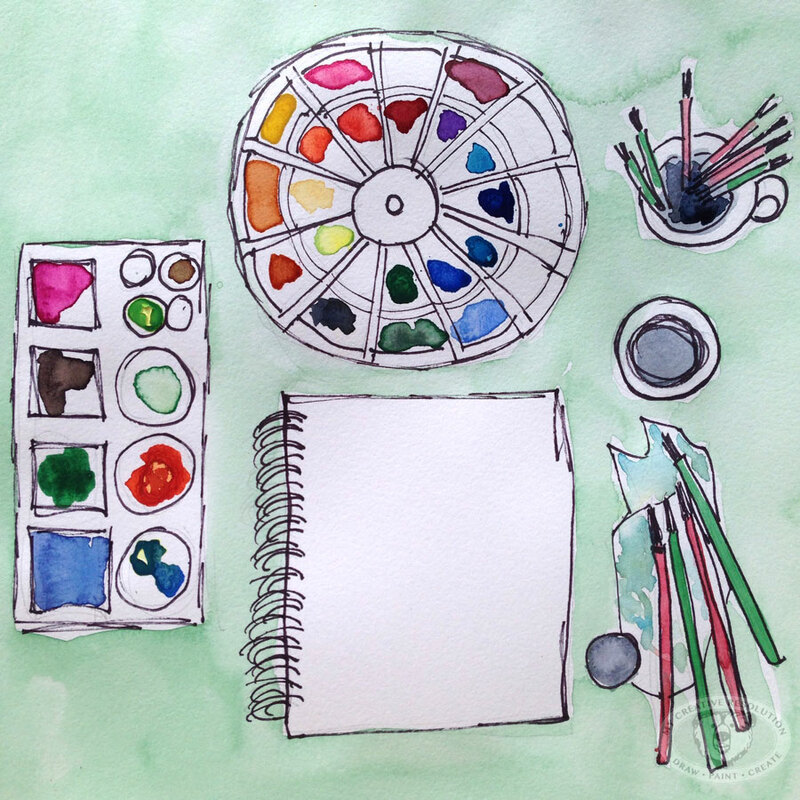 Categories: Resolution | Tags: Art, being creative, creative, Drawing, finishing, illustration, ink, painting, resolution, Sketch, sketchbook, watercolor | Permalink. I’m so excited! Check out my guest post here! And search for the hidden Halloween illustrations! 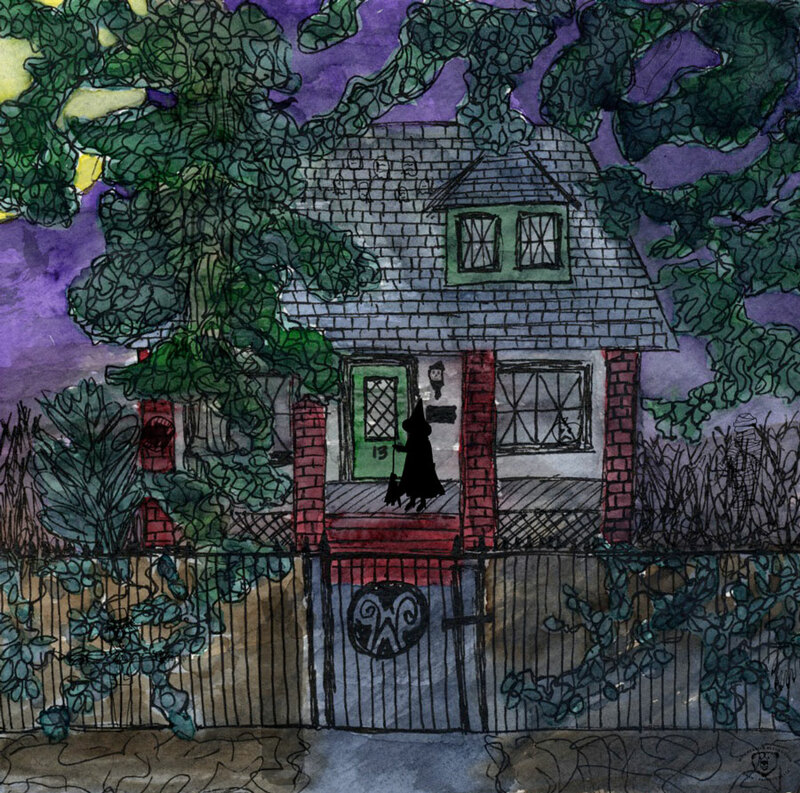 Categories: Process | Tags: doodlewashed, Halloween, hidden pictures, illustration, ink, pen, watercolor | Permalink. Halloween Illustration with 13 hidden pictures. Can you find them? Categories: Illustration | Tags: Art, bat, children's book, children's illustration, Halloween, Halloween hidden pictures, haunted house, illustration, ink, painting, skeleton, Sketch, sketchbook, skull, vampire, watercolor, witch | Permalink. I’ve learned so much since starting my creative resolution in 2014. About how important setting a goal is. But, not only do we have to set a goal, we need to outline the tasks that will get us there. As the year went on I added things like “figure drawing” to my list, and, as I focusted more on watercolor, acrylic painting moved to my monthly list. My 2015 creative resolution or goal was to “continue my creative journey.” Right from the start of 2015 I wrote a list of things I have always wanted to try. Some of these things were one time “tries,” while others I incorporated into my checklist (see the last three items). Categories: Uncategorized | Tags: achieving goals, Art, checklist, Drawing, goals, illustration, ink, painting, Sketch, sketchbook, watercolor | Permalink. Here is my pattern design for September. 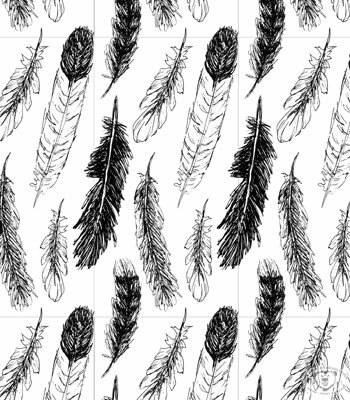 As you may have seen, I’ve been drawing and painting feathers all month, so it’s seemed appropriate to turn them into a pattern. I pieced this pattern together from my sketchbook (see below). I wanted this pattern to be much tighter than ones I’ve designed so far this year. This tighter pattern, required more playing and arranging in Photoshop becauses once I thought the pattern was “set” and I tried repeating it, things would overlap and I’d have to readjust and try repeating it again. If you know Photoshop and want to try creating a pattern, I’ve included my steps below. Arrange your elements. They can go over the guides. On a separate layer outline the guides to make a box. When you are happy with your repeating pattern, hide all the layers with the box outline. Below, you can see my boxes. The center box is where I have my guides (which are not visible). Slight variations on my feather pattern. No distress in the background. Copyright 2015 Eileen McKenna. All rights reserved. 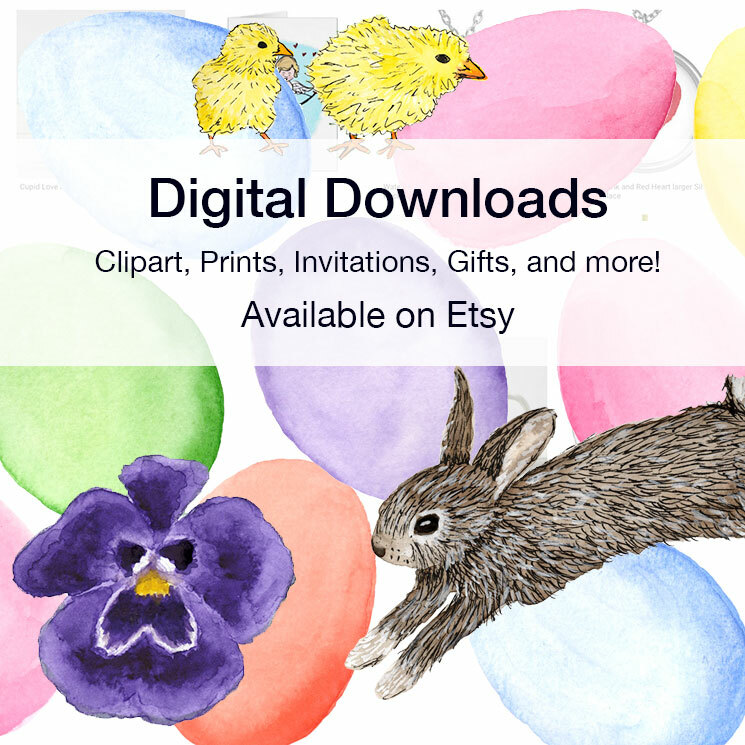 Categories: Digital, Patterns/Surface Design, Pen & Ink | Tags: Drawing, feathers, How to create a pattern, How to create a pattern in Photoshop, ink, pattern, pattern design, Photoshop, sketchbook, surface design | Permalink. I didn’t even realize I loved trees until they kept popping up in my paintings and illustrations. Drawing feathers was more of an accident. I was painting a sunflower when the watercolors bled beyond the shape of the sunflower. I moved on to another version, putting this accident to the side. Over the next couple of weeks whenever I looked at this accident, I saw a feather. 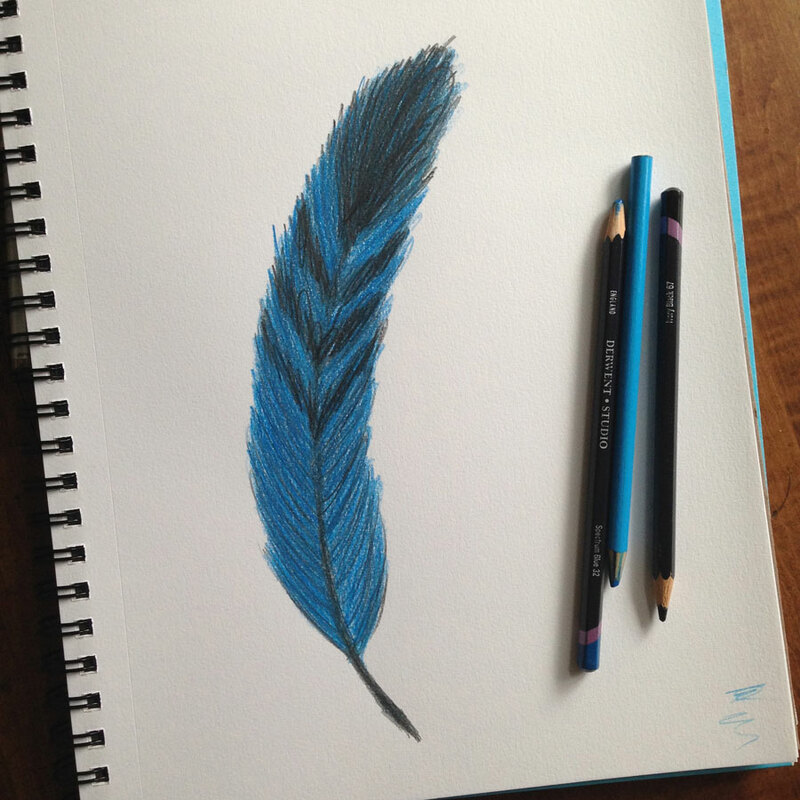 Eventually I added ink details to turn it into a feather. You can read more about that “happy accident” here. Since this “accident,” I’ve draw a lot of feathers, especially over the last couple of weeks. 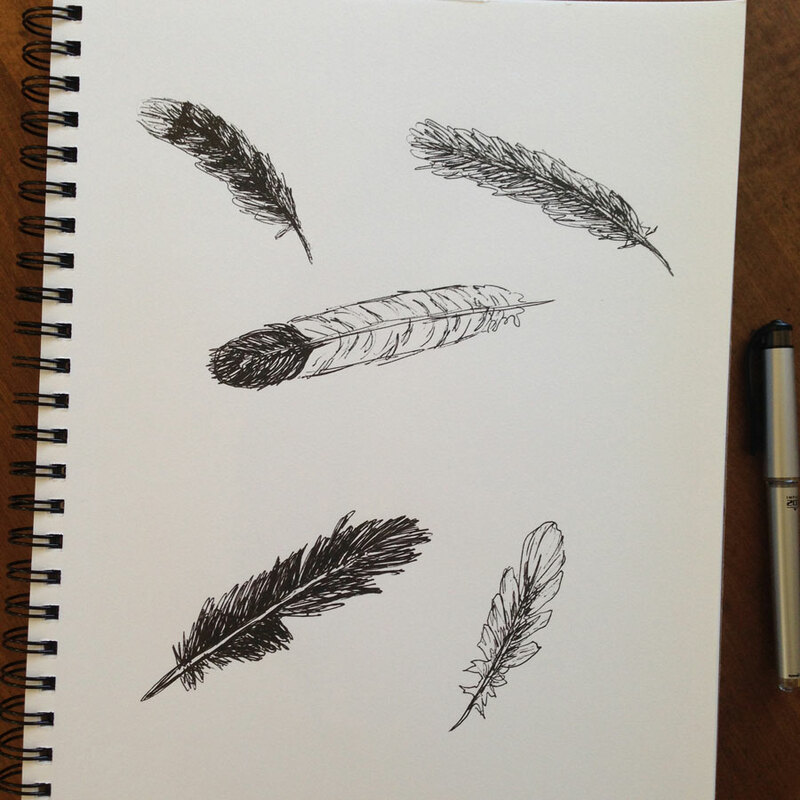 Recently I sketched several feathers in my book. I wanted to add a color background to them, so I started over and drew more feathers on watercolor paper. For two of the paintings I started with the simple outline of feathers, then painted the backgrounds, and a little color to some of the feathers. I added the feather details in ink after. 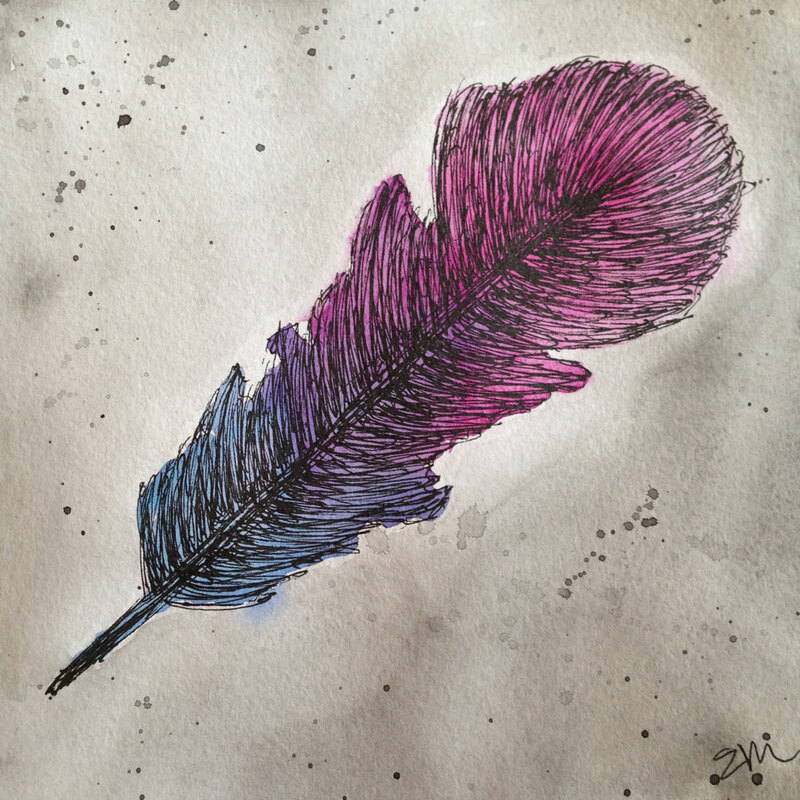 On the third painting, I painted a feather shape with a pink, purple, blue blend and added ink details afterwards. 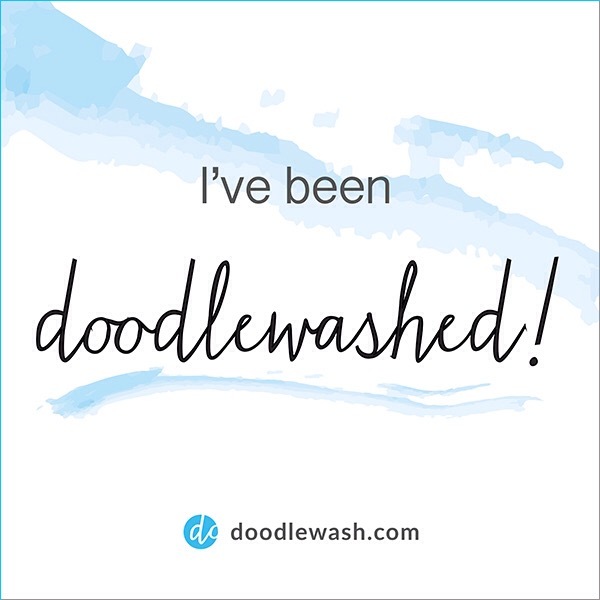 Categories: Pen & Ink, Watercolor | Tags: Art, draw, Drawing, feathers, illustration, ink, inspiration, painting, Sketch, sketchbook, watercolor | Permalink.